Provide comfort for the family of Maria Maldonado with a meaningful gesture of sympathy. Maria Maldonado, 94, of Longmont formerly of Greeley passed away on January 25, 2019 in Longmont. In loving memory of Maria Maldonado. Maria was born in Uvalde, Texas to Jesus Ortiz & Acension Rodriquez on September 15, 1924. On January 10, 1949 in Uvalde, Texas, Maria married the love of her life, Jose Maldonado. Maria was a fabulous home maker, she loved making breakfast burritos, knitting, sewing, and she especially loved dancing to Tejano music. Family was everything to Maria. She was a mom to all and never closed her doors to anyone. In her later years Maria was cared for by Elesia Maldonado and Elesia Fontes. Maria is survived by her children; Inez (Loretta) Maldonado, Luis Maldonado, Maria Dacus, Elesia (Marcelino) Maldonado, Arnulfo (Trina) Hernandez, 26 grandchildren; 92 great-grandchildren, 55 great-great grandchildren, 1 great-great-great grandchild, and a large loving extended family. 4 grandchildren and 7 siblings. A Public Viewing will be on Thursday, January 31, 6-8 pm at Northern Colorado Crematory located at 700 8th St, Greeley. To send flowers in memory of Maria Maldonado, please visit our Heartfelt Sympathies Store. Elizabeth Moreno sent flowers to the family of Maria Maldonado. 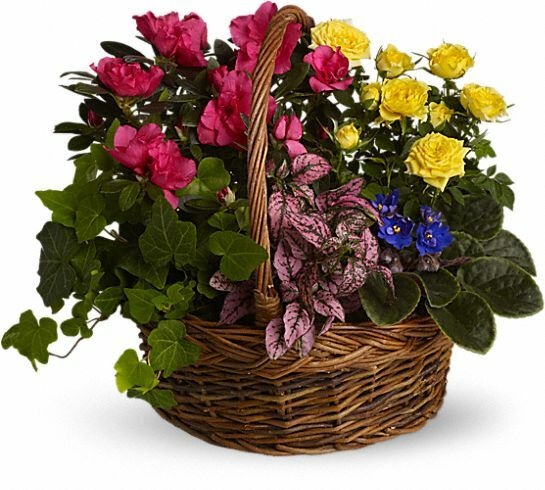 Elizabeth Moreno purchased the Blooming Garden Basket for the family of Maria Maldonado.